Bladon, Henry 2018. Should psychiatrists write fiction?. BJPsych Bulletin, Vol. 42, Issue. 02, p. 77. Racey, Daniel 2018. ‘To know before hand is to freeze and kill’ Commentary on… Should psychiatrists write fiction?. BJPsych Bulletin, Vol. 42, Issue. 02, p. 80. Wigand, Moritz E. Wiegand, Hauke F. Altintas, Ertan Jäger, Markus and Becker, Thomas 2018. Migration, Identity, and Threatened Mental Health: Examples from Contemporary Fiction. Transcultural Psychiatry, p. 136346151879425. Bladon, Henry J. 2017. The Missing Thread – How Fiction Cheats Mental Health Nursing. Issues in Mental Health Nursing, Vol. 38, Issue. 9, p. 687. Mason, Daniel Philippe 2017. “The Rack of His Imagination”: Literature and the Psychotic Experience. Academic Psychiatry, Vol. 41, Issue. 6, p. 711. Wigand, Moritz E Wiegand, Hauke F Rüsch, Nicolas and Becker, Thomas 2016. Personal suffering and social criticism in T. S. Eliot’s The Waste Land and A. Ginsberg’s Howl: Implications for social psychiatry. International Journal of Social Psychiatry, Vol. 62, Issue. 7, p. 672. Wigand, Moritz E. Rüsch, Nicolas and Becker, Thomas 2016. Jack Kerouac Revisited. The Journal of Nervous and Mental Disease, Vol. 204, Issue. 10, p. 728. Crawford, Paul Brown, Brian Tischler, Victoria and Baker, Charley 2010. Health humanities: the future of medical humanities?. Mental Health Review Journal, Vol. 15, Issue. 3, p. 4. Crawford, Paul and Baker, Charley 2009. Literature and Madness: Fiction for Students and Professionals. Journal of Medical Humanities, Vol. 30, Issue. 4, p. 237. Vamos, Marina 2008. The Cognitive Side Effects of Modern ECT. The Journal of ECT, Vol. 24, Issue. 1, p. 18. Hilton, Claire 2007. An exploration of the patient's experience of electro-convulsive therapy in mid-twentieth century creative literature: A historical study with implications for practice today. Journal of Affective Disorders, Vol. 97, Issue. 1-3, p. 5. Dali, Keren and Dilevko, Juris 2006. Toward Improved Collections in Medical Humanities: Fiction in Academic Health Sciences Libraries. The Journal of Academic Librarianship, Vol. 32, Issue. 3, p. 259. Wallang, Paul 2006. The use of literary analysis in advanced communication. Psychiatric Bulletin, Vol. 30, Issue. 11, p. 432. Oyebode, Femi 2004. Fictional narrative and psychiatry. Advances in Psychiatric Treatment, Vol. 10, Issue. 2, p. 140. Bell, Vaughan 2004. Book review. Cognitive Neuropsychiatry, Vol. 9, Issue. 4, p. 315. Bamforth, I. (2001) Literature, medicine, and the culture wars. Lancet, 358, 1361–1364. Bloom, H. (2000) How to Read and Why. London: Fourth Estate. Cawley, R. H. (1993) Psychiatry is more than a science. British Journal of Psychiatry, 162, 154–160. de Botton, A. (1997) How Proust Can Change Your Life. London: Picador. Downie, R. S. (1994) The Healing Arts. Oxford: Oxford University Press. Downie, R. S. & Charlton, B. (1992) The Making of a Doctor. Medical Education in Theory and Practice. Oxford: Oxford University Press. Eliot, T. S. (1948) Notes Towards the Definition of Culture. London: Faber & Faber. Evans, M. & Greaves, D. (1999) Exploring the medical humanities. BMJ, 319, 1216. General Medical Council (1993) Tomorrow's Doctors. London: General Medical Council. Greenhalgh, T. & Hurwitz, B. (1998) Narrative Based Medicine. London: BMJ Books. McLellan, M. F. & Jones, A. H. (1996) Why literature and medicine? Lancet, 348, 109–111. McManus, I. C. (1995) Humanity and the medical humanities. Lancet, 346, 1143–1145. Neve, M. (1993) Medicine and literature. In Companion Encyclopedia of the History of Medicine (eds Bynum, W F. & Porter, R.), Vol 2, pp. 1520–1535. London: Routledge. Porter, R. (1999) Reading: A health warning. In Medicine, Mortality and the Book Trade (eds Myers, R. & Harris, M.), pp. 131–152. Folkestone: St Paul's Bibliographies. Rolfe, I. E., Pearson, S., Powis, D. A., et al (1995) Time for a review of admission to medical school? Lancet, 346, 1329–1333. Rousseau, G. S. (1986) Literature and medicine: towards a simultaneity of theory and practice. Literature and Medicine, 5, 152–181. Smith, R. (1999) Editor's choice – struggling towards coherence. BMJ, 319. Snow, C. P. (1959) The Two Cultures and the Scientific Revolution. Cambridge: Cambridge University Press. Steiner, G. (1971) In Bluebeard's Castle: Some Notes Towards the Re-definition of Culture. London: Faber & Faber. Tallis, R. (1995) Newton's Sleep. The Two Cultures and the Two Kingdoms. London: MacMillan Press. Wassersug, J. D. (1987) Teach humanities to doctors? Says who? Postgraduate Medicine, 82, 317–318. Williams, D. D. R. & Garner, J. 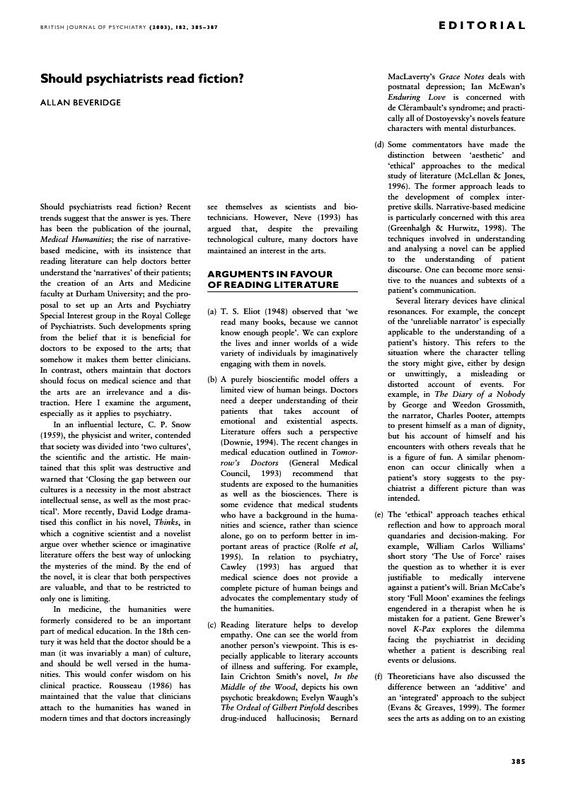 (2002) The case against ‘the evidence’: a different perspective on evidence-based medicine. British Journal of Psychiatry, 180, 8–12. Sir,The answer has to be yes and furthermore "The ordeal of Gilbert Pinfold" should be required reading for every aspiring psychiatrist as it highlights better than any psychiatric text the nature of a psychotic state.